We're taking a little bit of a detour, mainly because I moved today and it was pretty hectic. I was hoping to get this up sooner but I'm on the verge of falling asleep at my keyboard and figured I'd do one of my silly guilty pleasures, good ole Jason in Space itself, Jason X. The main reason I chose this was because How Did This Get Made recently picked this for their Halloween film and it reminded me of just why I love all the dumb stuff that inhabits its 90 minute runtime. Is it even 90 minutes? I feel like you could say this movie was 75 minutes long and I would believe you. As I said before, I love this movie. It's silly and doesn't ever try to be anything more than a fun time at the movies. 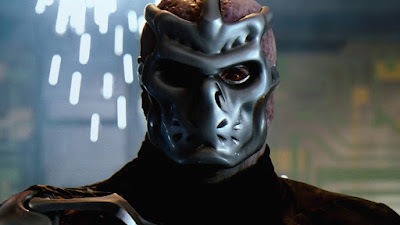 There's a high body count and they even do their best to introduce an entirely new element to Jason: Uber Jason. I liked how ridiculous it was while somehow taking place almost entirely in space and still feeling like a Friday the 13th movie. Don't get me wrong though, it also feels like a Sy Fy Original Movie. I love how this movie randomly shifts into Aliens partyway through. It's not surprising when you hear that Todd Farmer had that in mind when he was writing the script and had it intended it to be even closer.